When our team does a rough-in (pre-wire) of ceiling mounted devices, we try not to get too close to the walls. 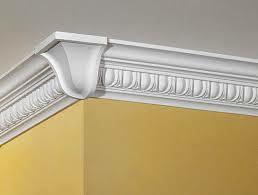 It is common for a crown-mold to go up; that could be 6 or 8 inches into the ceiling. We won’t know where crown mold will be at the rough-in stage. We could ask, but it will vary by room, and may change before it is complete. What we typically do is just assume it will always be there and that way we won’t have a problem.